On April 11th, Iceland Post will release two beautiful Europa stamps. The theme for Europa 2019 is „National birds”. 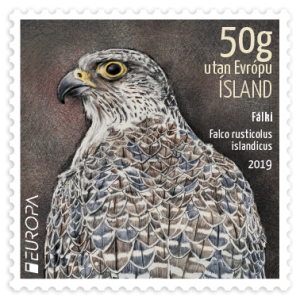 In conjunction with the PostEurop Birdproject 2019, the stamps have an exciting special feature this year: by scanning the stamps with your smartphone using the free CEE-App, you will be able to hear the sounds of the birds. How cool is that?! 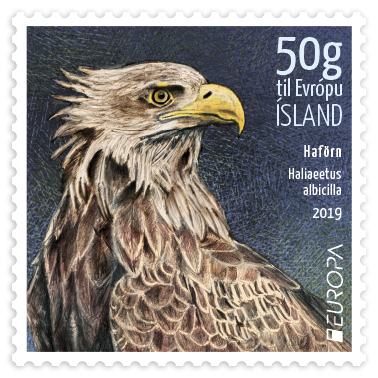 The birds featured on the Icelandic stamps are the White-tailed eagle (Haliaeetus albicilla) and the Gyrfalcon (Falco rusticolus). Both stamps were designed by Hany Hadaya. White-tailed eagles are among Iceland’s rarest breeding birds. Once quite common across Iceland, nowadays they are most often seen in the western part of the country, with the occasional eagle spotted in the South. On the brink of extinction in Europe in the latter part of the last century, in Iceland the white-tailed eagle has been strictly protected by law since 1914, which helped the population to recover, albeit slowly. Thanks to conservation efforts, Iceland’s white-tailed eagle population is in a much better way than it had been for almost a century : 2014 was one of the best years in numbers with 73-74 breeding pairs and around 40 fledglings. Today in Iceland the population is relatively stable and counts around 70 breeding pairs. 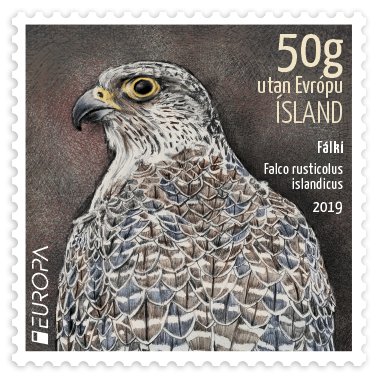 Represented in many folktales, the gyrfalcon (Falco rusticolus) is one of Iceland’s most famous birds… in fact, Iceland’s only Order of Chivalry is the Order of the Falcon (Hin íslenska fálkaorða in Icelandic) Up to a third of Europe’s gyrfalcon population breeds in Iceland. Their typical prey includes the snow ptarmigan, and the populations of both birds fluctuate conjointly. The gyrfalcon population is small and vulnerable, and it is protected under Icelandic law. 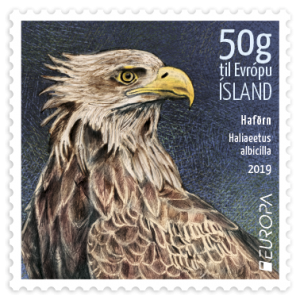 The idea behind “The Europa Bird Stamps Project 2019” is to connect sound files to the 2019 Europa stamps. It is a truly smart and fun addition to otherwise traditional stamp issues! Download the free CEE-App, scan the stamps and listen to the birds sing! The stamps are available from our webshop. You can email us at stamps@stamps.is or telephone us on : + 354-580-1050 from 9am to 4pm Icelandic time. You can also contact us on Icelandic stamps’ facebook page. See you there! PS – if you’re interested in seeing more of Postphil’s products on the theme “birds”, why not take a look here? For bird lovers, Postphil also has a nice selection of postcards, including the White-tailed eagle, the ptarmigan and the puffin, to name but a few….